"Besides keeping him indoors, the best way to assure your cat's health and longevity is to give him a good diet. It's false economy to skimp on the quality of your cat's food. Offer him the best cat food you can obtain. A few extra pennies for high-quality food will pay huge dividends in the quality of his health and life. Those pennies will save you hundreds of dollars in veterinarian bills." Proper nutrition is so important for your kitten or cat's health. If your cat is sick, has any special needs, is seriously overweight, or just for your own peace of mind, consult with your veterinarian about the proper diet and best food for your cat. If your veterinarian prescribes a particular type or brand, you should think of it as "medicine" and follow your veterinarian's advice exactly. If you have any doubts, get a second opinion. Important Note: The information provided here is general information based on the requirements of a healthy feline. Consult your veterinarian if you have any questions or concerns or suspect your cat or kitten may be ill.
Just as higher quality "people food" is better for your own health, higher quality pet food will be better for your cat's health. The healthy food you choose should be appropriate for your cat or kitten's current health status, physical condition, activity level, and life stage. And of course, your cat or kitten should like the taste! The ASPCA recommends a "complete, high-quality food made by a reputable manufacturer, approved in feeding trials by the American Association of Feed Control Officers (AAFCO)." Just as you read nutrition labels for yourself, you should also read the label of anything you feed your cat or kitten. The words "complete and balanced" should be on the label. Government agencies regulate what can be put on pet food labels, so food with these words should be healthier for your cat. Some manufacturers cater to different life stages, for example, "kitten," "adult," or "senior." Other manufacturers' food is appropriate for "all life stages." Check the label to make sure the cat food you buy is the right one for the age and life stage of your cat. An animal protein, such as chicken, fish, liver, or beef, should be the first ingredient listed on the label. If the first item listed is not an animal protein, move on. An AAFCO statement. This shows that the food has passed rigorous feeding tests. Many pet health experts debate whether AAFCO standards are high enough, but in any case, this should be a minimum requirement. Here are some sample AAFCO statements. The "dry weight protein" should be at least 26% for your healthy adult cat. Kittens need even more protein and a premium cat food brand that says it's specifically for kittens should have a higher level of protein. Unfortunately, most companies don't list the dry weight protein and you'll have to do some math to get to it. A reputable manufacturer. Avoid generic brands, store brands, and low-priced discount brands. Saving money in the short run can cost you lots more in veterinary bills later. Contact information for the manufacturer. This way, if you want to, you can learn more about the company, its quality control, feeding trials, and ingredients. If you plan to change the food you're serving your cat, it's usually best for your cat's health to change food gradually. Gradually changing the food will make it easier on his or her digestive system and will allow your kitty to get accustomed to the new taste. 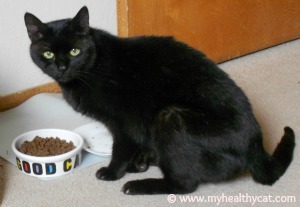 See my Changing Your Cat's Food article for more help with safely changing your kitty's diet. Dry Food or Wet Food - Which is Best? Healthy cat food comes in both dry (kibble) and wet food. If you buy a premium food, both should be nutritionally equal. The decision about whether to serve your cat dry or wet food should depend on your cat's preference, your schedule, and your vet's recommendations. However, veterinarians have different opinions about this, so you may have to ask your vet more questions about his or her recommendations. Although it's always important to have fresh water available for your kitty, this is even more important if he or she eats only dry food. Be sure to always use clean bowls for food and water. Our feline friends do not need milk. The label on the can or package will tell you the general guidelines of how much food you should serve your kitty. These guidelines are based on an average healthy cat (is any cat really ever average?!). Your feline companion is an individual and may need more or less than what the guidelines say, but the guidelines are a good starting point and you shouldn't move too far from them unless your veterinarian recommends otherwise. Most cats love treats and there is no reason a healthy cat should not be given treats. However, it's best to give them to your kitty sparingly. Give one, or just a few, at a time. Treats should not make up more than 5% of your cat's daily food intake. For your cat's good health, be sure to give your kitty healthy cat treats and not "junk food." Never give your cat "people food" treats. These are bad for your kitty's digestion at best and poisonous at worst. If your cat stops eating or takes only a few bites and wanders off for more than two meals in a row, consult your veterinarian immediately. For transparency and disclosure, you should assume that all links on this page are affiliate links and that I do receive a commission if you click through and make a qualifying purchase. That said, please note that I only recommend products that I believe in. Life's Abundance is my #1 recommendation for the best cat food online (or anywhere!). This is what I have fed my healthy cats for years. They love it and I feel confident that they are getting the best possible feline nutrition. None of Life's Abundance's ingredients have ever been recalled. Try a sample to make sure your feline friend likes the taste. Only Natural Pet Store is my #2 recommendation for buying pet food online. They carry only natural products using top ingredients. The pet foods they carry are made from "human grade" products and exceed all AAFCO standards. Plus, they have a low price guarantee. High Protein Cat Food Why do felines need animal protein in their diet? Cat Feeding Schedule What's the best time to feed your kitty? Vegetarian Cats Can cats eat a vegetarian diet? Water or Milk? Does your feline friend need milk? Use the Search Box to find more feline info.